Cords and braids have been common details in Viking age clothing. They have been used along the upper edges of smokks, along the front edges of women’s coats and caps and probably in several other places even if we don’t have any evidence. 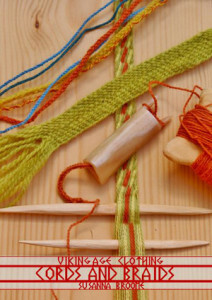 Interesting is that in all known cases where a tablet woven braid has been sewn on top of the upper edge of a smokk, there has been a cord along the upper edge of the tablet weaving. We don’t know how the wider braids were used, but a possible interpretation is that they were used as garters. Their flexibility makes them suitable for that, and such braids have been used as garters in later times. All the cords and braids that I have found have been made in wool yarn of different thicknesses. In most cases we know nothing of the colours, but we can guass that adorning details often had more and stronger colours than the rest. The following techniques are described in the booklet about Cords and Braids. See Bibliography for sources. For resellers see Links. After Finds from Kaupang, Køstrup och Dublin.Have been used for adorning the clothing; along the upper edge of smokks and the front edge of a cap. No remains of colours were left. Interpretation of several cord finds with triangular cross-sections from Birka. Have been used to adorn the clothing; along the upper edge of smokks and the front edge of open women’s jackets. Finger-loop braids have a triangularish cross-section, but other interpretations are also possible. No remains of colours were left. After two finds from Gotland, and several finds of knitting spools from e.g. Sigtuna and Lund, from the 11th century. May have been used for pulling a purse opening together and as a pearl cord. Spool-knitted/lucet cords have a square cross-section. No remains of colours were left. After a find from Dublin where it was sewn to the front edge of a cap. Three-strand braids are flat. No remains of colours were left. Inga Hägg’s interpretation of a find from Haithabut where it was sewn along the edge of a fitting seam on the back of a smokk. The braid was made of three red and three yellow strands, but I have not found any information about how they were distributed. After finds from Mammen and Birka. No remains of colours were left; the picture shows a single-colour braid, but patterns are also possible. Unknown use, but a possible interpretation is that it was used as a garter. After two fragments from Birka. No remains of colours were left; the picture shows a pattern possible to make with the technique. Unknown use, but a possible interpretation is that it was used as a garter.